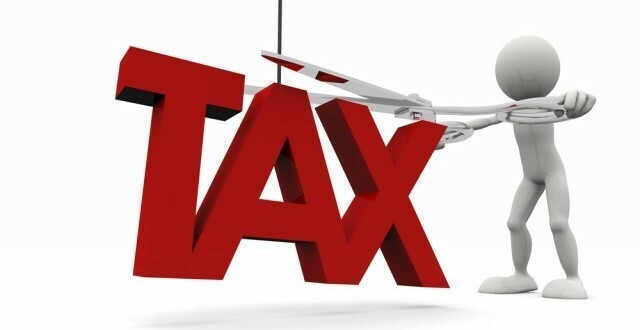 Tax is the one of trade barriers. It affects on science and technology development of Thailand because the scientific instruments are not manufactured locally. An example on the development is Thailand had reduced the import duty of scientific instruments/equipment from 35% to 5%. The consequence of this support was to drive and stimulate the research and development projects of Ministry of Science, Technology and Environment. 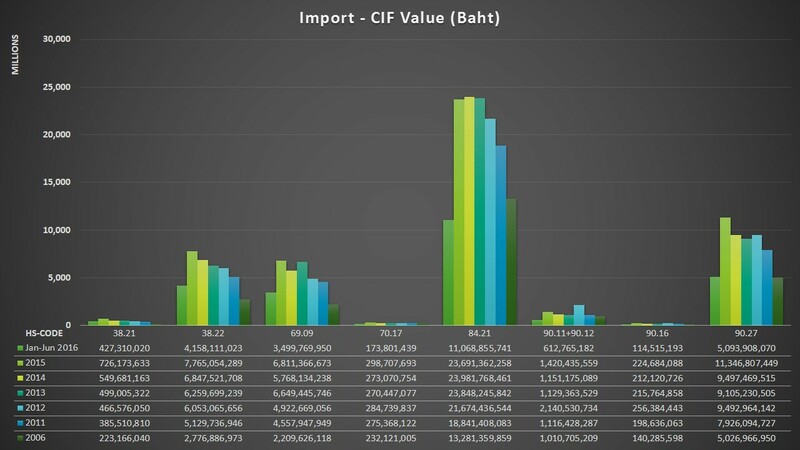 Even the government lost 1,800 million baht of import duty, but the private sectors got a lot of benefits. The cost of the equipment/instruments was reduced. That was meant the buying power were risen to 22%. The government also projected that the investment value of R&D and quality control laboratories were around 12,500 million baht. This encouraged the export of agricultural products and the quality development of all industries to comply the international standard also. The corporate income tax that the government charged the private sectors at that time was 2,000 million baht per year excluding the income distribution and rising turnover of related business. Now, there is no more import duty reduction policy but the government still support the R&D such as 300% Tax Incentive and R&D supportive projects and training projects thru the government bodies. These could lead the usage of scientific equipment/instruments also. Refer to the Agreement on Technical Barrier to Trade (TBT), WTO allowed the members to regulate the technical barrier on unqualified goods importing to the country based on science, product quality and safety. That is the reason why Thailand, the exporting country, have to pay more attention to the quality control. To cope with the quality issue, scientific equipment/instruments must be applied more in terms of quantity and the efficiency on sensitivity, accuracy, precision and cost effectiveness. Join Thailand LAB INTERNATIONAL 2016 at September 21-23 at BITEC, Bangna, Bangkok to see how the technological advancement of scientific equipment/instruments solve the industrial problems. For more information about the show and pre-registration, please visit www.thailandlab.com. 38.21 Prepared culture media for development of micro-organisms. 38.22 Diagnostic or laboratory reagents on a backing and prepared diagnostic or laboratory reagents whether or not on a backing, other than those of heading No.30.02 or 30.06. 69.09 Ceramic wares for laboratory, chemical or other technical uses; ceramic troughs, tubs and similar receptacles of a kind used in agriculture; ceramic pots, jars and similar articles of a kind used for the conveyance or packing of goods. 70.17 Laboratory, hygienic or pharmaceutical glassware, whether or not graduated or calibrated. 84.19 Machinery, plant or laboratory equipment, whether or not electrically heated (excluding furnaces, ovens and other equipment of heading 85.14) for the treatment of materials by a process involving a change of temperature such as heating, cooking, roasting, distilling, rectifying, sterilising, pasteurising, steaming, drying, evaporating, vaporising, condensing or cooling, other than machinery or plant of a kind used for domestic purposes; instantaneous or storage water heaters, non-electric. 84.21 Centrifuges, including centrifugal dryers; filtering or purifying machinery and apparatus, for liquids or gases. 90.11 Compound optical microscopes, including those for photomicrography, cinephotomicrography or microprojection. 90.12 Microscopes other than optical microscopes; diffraction apparatus. 90.16 Balances of a sensitivity of 5 cg or better, with or without weights. 90.27 Instruments and apparatus for physical or chemical analysis (for example, polarimeters, refractometers, spectrometers, gas or smoke analysis apparatus); instruments and apparatus for measuring or checking viscosity, porosity, expansion,surface tension or the like; instruments and apparatus for measuring or checking quantities of heat, sound or light (including exposure meters); microtomes.